The internationally acclaimed, singing sensation Jake Miller is pretty much our favorite person on this planet and for so many reasons – he’s incredibly talented and brings out some of the most magnificent music we have ever heard, he’s amazing with his fans and always takes time out of his day to connect with them, and despite all of his massive success, he continues to be one of the most down-to-earth and humble individuals ever. Should we keep going on all of the endless amount of reasons why Jake Miller is the best? Well today, November 28th marks a very special day as it is the remarkable musician’s birthday and he gave all of us a very special present as he has just released tour dates for his “The Overnight” tour. BRB, we’re all totally fan-girling. Jake Miller will be making stops nationwide in Los Angeles, New York City, Miami, Orlando, Boston, San Francisco, Houston, and many, many more cities and he will be leaving everyone mesmerized and in awe yet again with his impeccable talent and stupendous performances. Jake Miller will also be bringing along his friends MAX and Spencer Sutherland on tour with him. Here at Alexisjoyvipaccess.com, I’d like to wish the genuine, extraordinary, and exceptional Jake Miller a very, very Happy Birthday! 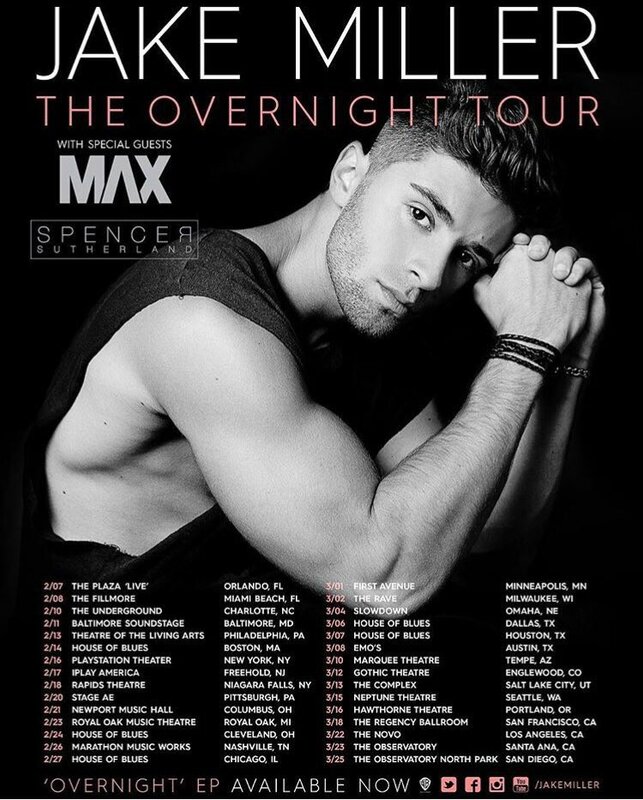 Be sure to join Jake Miller on his “The Overnight” tour – tickets go on sale this Friday! Comment below and tell me or tweet me at @alexisjoyvipacc, what city or cities will you be seeing Jake on tour? Previous Article: Check Out The Nominees For The 2017 People’s Choice Awards And Be Sure To Get Your Votes In Now! Next Article: Get The Inside Scoop About Mariah Carey’s Show “Mariah’s World” & Tune In To Her Interview With Jorge Bernal On “Suelta La Sopa” 11/29!